X-Force rescues Rusty & Skids from the Friends of Humanity. The Friends of Humanity attack a transport transferring Rusy & Skids from the Vault, and capture the mutants. Shortly thereafter, X-Force returns from their fight with the X-Ternals, and Cannonball announces they're heading out on another mission: to rescue Rusy & Skids. At the X-Mansion, Professor X tells Val Cooper that he's asked X-Force to retrieve Rusty & Skids, who were on their way to him for treatment. In Boston, Vanessa agrees to bring Domino, Grizzly & Hammer to X-Force, over Domino's protests. In space, a mysterious figure pulls together the scattered remains of Graymalkin. 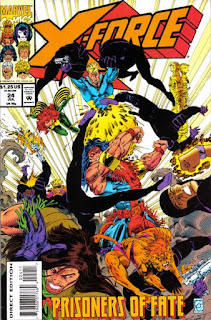 Back on Earth, X-Force infiltrates the Friends of Humanity's compound, easily overpowering the men stationed there and rescuing their former teammates, despite Rusty & Skids remaining thoroughly brainwashed and going on about Stryfe. 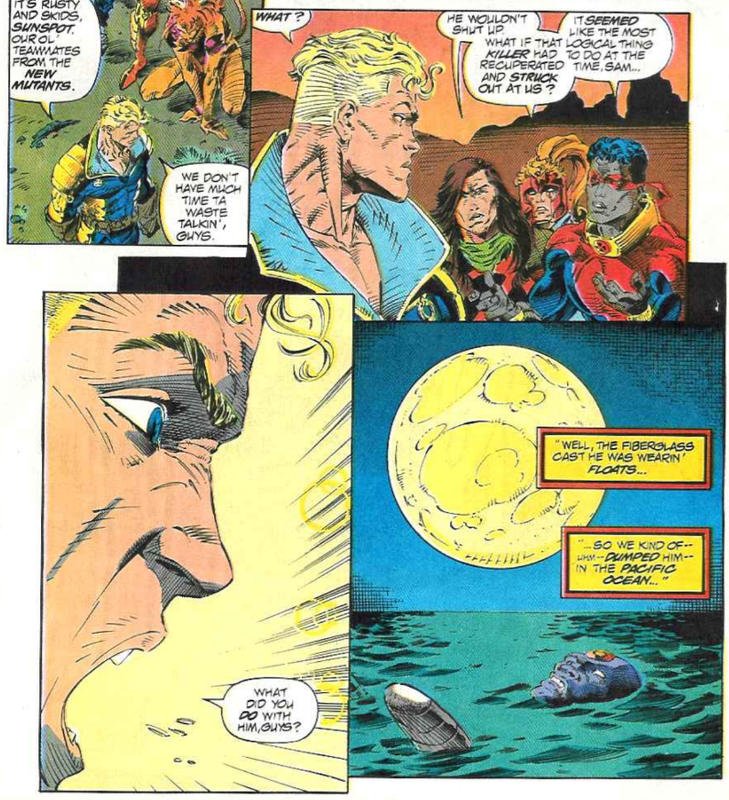 Spotting some of the Friends' anti-mutant literature, Cannonball wonders to Boomer if there's any way for humans and mutants to get along, and Boomer replies they'd better, since there's nowhere else to go. 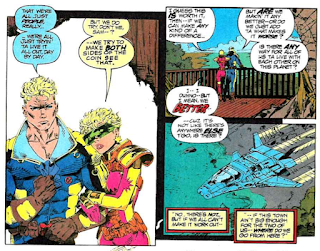 Rusty & Skids, last seen getting captured during the fall of the MLF in "X-Cutioner's Song", return this issue, and it's confirmed that they were brainwashed into joining the MLF. The issue ends with the pair still brainwashed, but in X-Force's custody, and they'll appear in the next issue as well. They are rescued by X-Force from the Friends of Humanity, the anti-mutant organization led by Gradyon Creed, first mentioned in Uncanny #299. 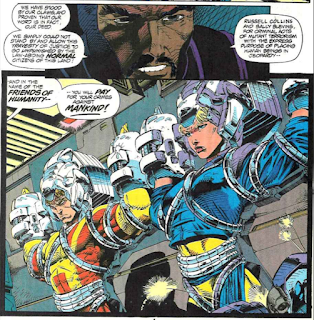 This issue shows that the Friends are a militant group, possessing high tech weapons and willing to use them against mutants. 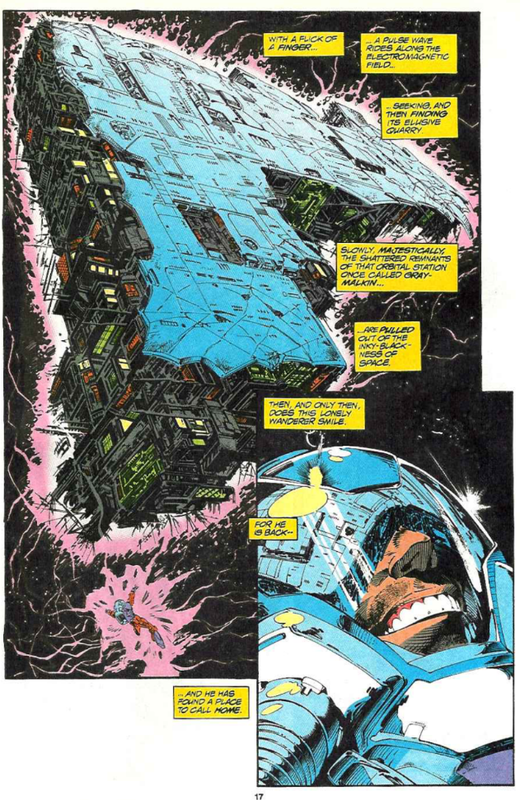 In a brief interlude, a mysterious figure pulls together the remnants of Graymalkin still in orbit around Earth; next issue will reveal this to be Magneto, making his first on-page appearance since his death (though not yet directly identified), while the remains of Graymalkin will form Avalon, his space station successor to Asteroid M.
There's a pair of bad footnotes in this issue, one citing X-Factor #89 as the issue where Rusty & Skids were captured (it was #85), another citing Uncanny #298 as featuring Xavier's talk show appearance (it was #299). 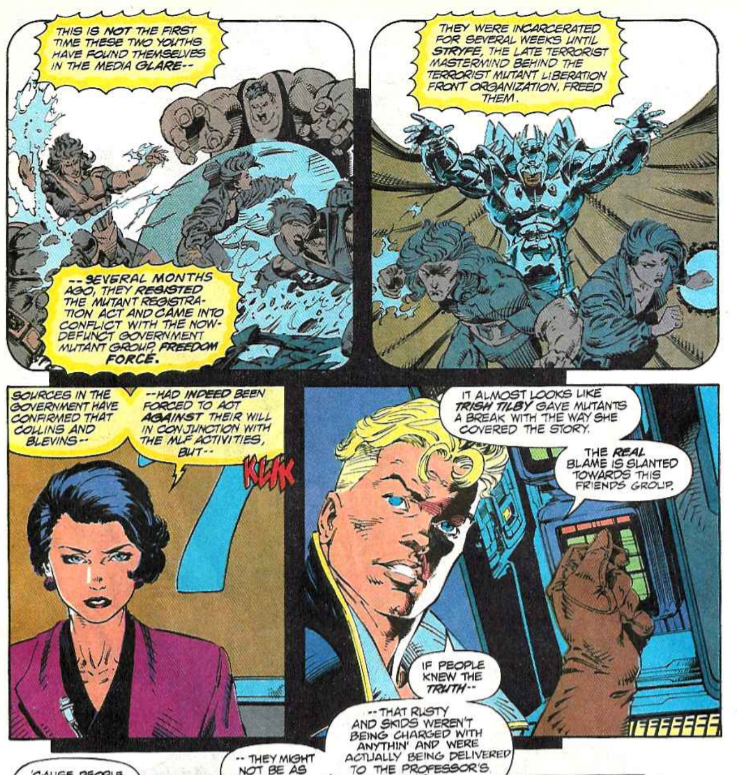 With concern over the optics of sending X-Factor to bust up a human-only group, and the X-Men busy, Xavier contacts X-Force (without initially telling Val Cooper) to rescue Rusty & Skids, a nice depiction of X-Force's post-"X-Cutioner's Song" status quo as a group apart from the larger X-Men/X-Factor coalition, but still not entirely isolated, which also fits with their general "the X-Men, but more extreme" motif. 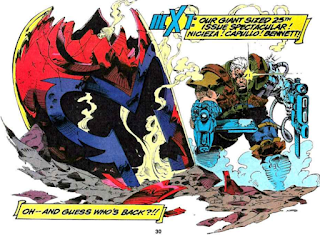 Not that Marvel had been terribly coy about the imminent returns of Magneto and Cable prior to this (I mean, Cable was already back in his own series), but the final page of the issue features a non-narrative tease of the next issue, which makes it pretty clear both will be back in that issue. This issue makes a point of introducing Richard Bennet on inks, though he has popped up a few times prior to this issue. He'll continue to get work (including pencilling) throughout the line, usually fill-in or one-off work, for the next year or so. 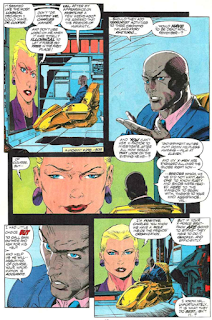 The change from Harry Candelario to Bennet on Capullo's pencils is certainly noticeable, and consistent with his later work. 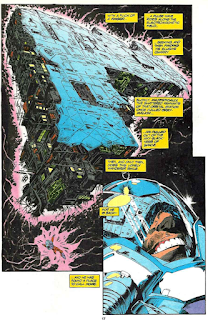 As the issue opens, Rusty & Skids are being transported from the Vault, the de facto super-villain prison in the Marvel Universe at this point in time. 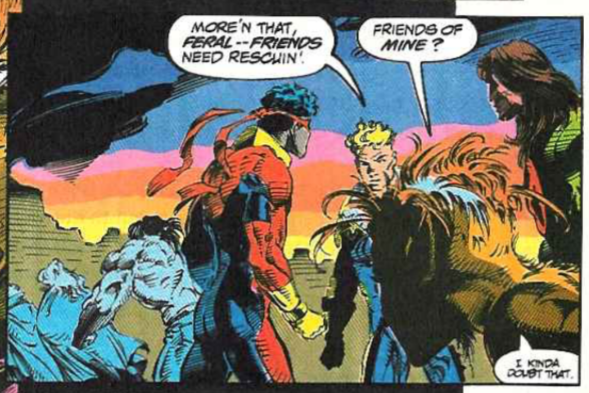 When Cannonball announces that X-Force is going to rescue some old friends, Feral mutters that they probably aren't her friends. 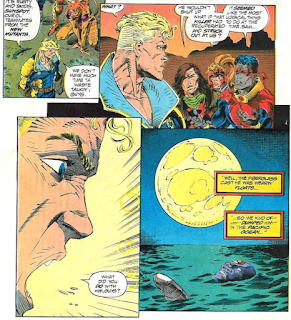 It's also revealed that X-Force dumped Krule into the ocean between issues. 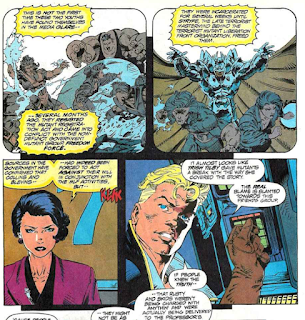 Trish Tilby is on hand reporting on the history of Rusty and Skids, featuring some panels loosely based on scenes from old New Mutants issues. Cannonball also notes that Trish gives the pair as fair a shake as possible. 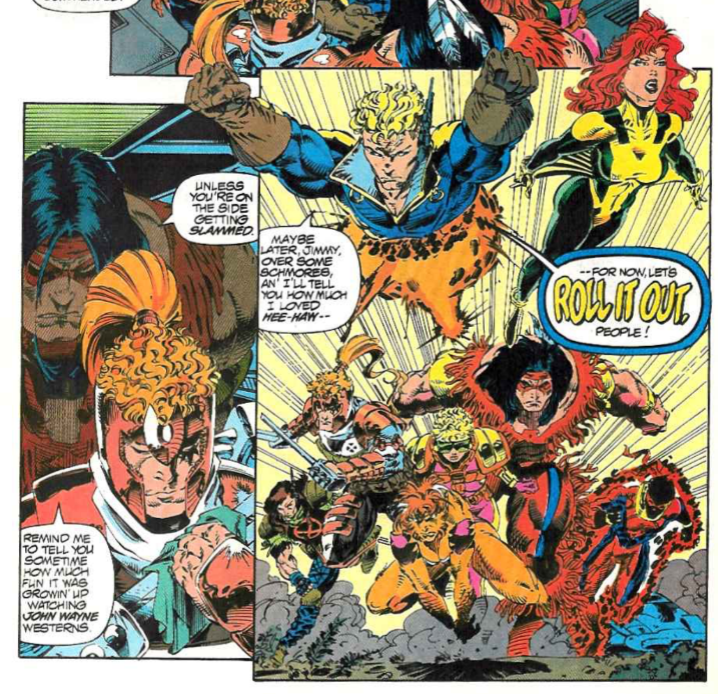 There's hilarious script/art disrepancy as X-Force moves in on the Friends base, as one page ends with a bombastic panel of the team blasting into action as Cannonball loudly declares "roll out!". Then on the next page, everyone is quietly hiding in the bushes as they reconnoiter the location and split into squads. 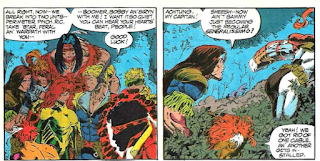 In splitting the team into two squads, Cannonball fails to put Siryn in charge of one, something which rankles her, a great bit of characterization from Nicieza. Before leaving to take Domino to X-Force, Vanessa shoots the unconscious Deadpool and Sluggo, though she's apparently shooting them with lasers and points out it's nothing they can't recover from. Warpath makes a reference to watching John Wayne movies growing up, and what that was like for a Native American. Cannonball, who is from Kentucky, counters that he was no fan of the show HeeHaw. He also he mentions s'mores, but it's spelled "schmores" for some reason. 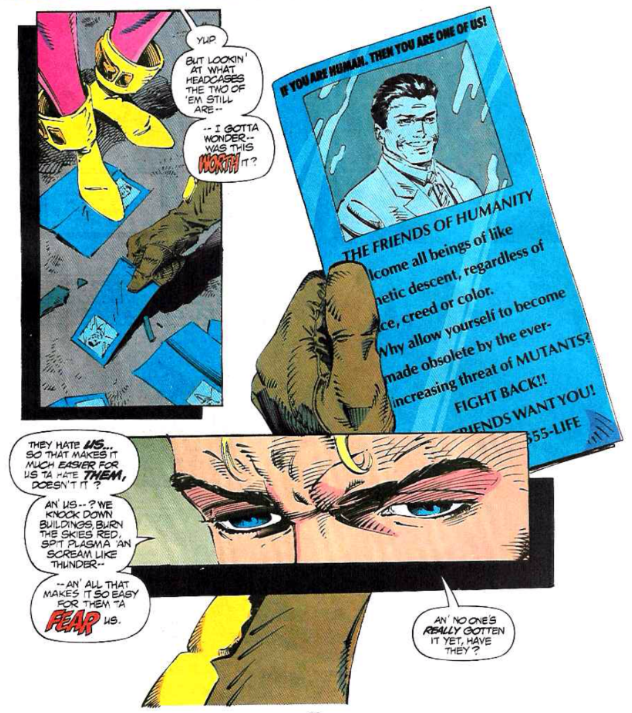 The issue ends with Cannonball ruminating on the Friends of Humanity hatred towards mutants, and whether it's possible for both sides to ever get along. 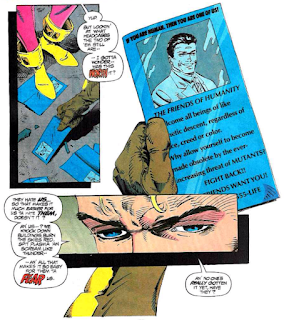 Nicieza continues to plumb the series/New Mutants' continuity for story ideas, here bringing back Rusty and Skids to follow up on their arrest during "X-Cutioner's Song" and confirm once and for all that they were brainwashed into working with the MLF. It's an appreciated bit of narrative clean-up for two relatively important New Mutants characters (especially to Boomer & Rictor), and in the process, Nicieza also strengthens this series' connection to the other X-books, with X-Force filling in for a politically-handicapped X-Factor while picking up a narrative thread introduced in Uncanny X-Men in the Friends of Humanity and revealing them to be an extreme (and well-armed) organization prepared to perform violence against mutants, which in turn furthers the general rise in anti-mutant sentiment that is meant to be permeating the books at this point in time (something which isn't always coming across). The end result is that the series, which was once isolated from all the other X-books more than any other (save Excalibur), is now firmly intertwined with the rest, which makes for a much richer and rewarding reading experience for what was once an ephemeral, near-throwaway title with little regard for happenings in other series, or even the continuity of its own characters. Tomorrow, Excalibur fights the future in Excalibur #67. Next week, Marvel Universe Series IV! "Before leaving to take Domino to X-Force, Vanessa shoots the unconscious Deadpool and Sluggo, though she's apparently shooting them with lasers and points out it's nothing they can't recover from." I always read this as the first indication of Deadpool's healing factor- i.e. a normal person would have been killed but Deadpool will make a full recovery. This issue came out 3 weeks late. I was quite taken by the look of Deathblow/Wolverine from Aron Wiesenfeld, Richard Bennett, and Monica Bennett when it came out, despite it not being a project that would normally pique my interest. I’m not sure if I bought #1 off the racks or just gave it a flip-through and then grabbed it from a quarter bin later. I’m also not sure whether I ever got #2, but the fact remains the first issue made an impression.